Abortionist and socialist Howard Dean is the perfect contemporary spokesman for the Demockacrat Party. And if his recent tripe about the Republican Party being the part of white people doesn't awaken black America to the plantation masters that the Demockacrats have been to them, then nothing will. After all, to what, really, can black America point, other than the enslaving welfare system, that the Demockacrats have really done for them? Let them trace the history of racsism of the Demockacrats against blacks back to 1854 to the present. The Dems even filibustered the Civil Rights Act of 1964. And now they, white Dean and black Obama, play the race card without conscience and apparent consequence. This will backfire at the polls in November and thereafter. When Lyndon Johnson signed the Civil Rights Act of 1964, he reportedly told one of his advisors that he had just "handed the South to the Republicans for the next fifty years." As you well know, the parties at that time underwent an ideological shift; the southern "Dixiecrats," appalled at the idea of civil rights for all races, abandoned the Democratic party and became members in very good standing with the Republicans. Today, the division is just as clear. Minorities overwhelmingly support the Democratic Party, and the South has not voted Democratic since 1964. 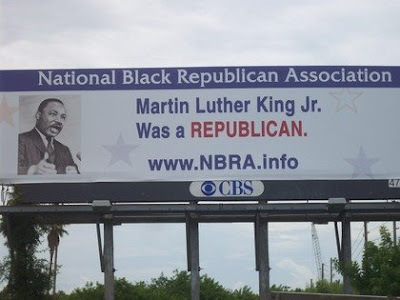 Dr. Martin Luther King, Jr., may or may not have been a Republican; that much is disputed, even by his family. He most certainly supported the Civil Rights Act, which Republicans adamantly opposed. Which party, I ask, has fought for higher standards of living for minorities? Which has fought for legislation toughening the penalties on hate crimes? Which has consistently supported, not challenged, minorities' right to simply cast a vote? Which holds the vast majority of elected representatives of color and of women? Which has nominated an African American for the Presidency? The party of Lincoln abandoned the higher angels of its nature in 1964, and has not looked back. The men in Texas who dragged a black man to his death behind a pickup truck: do you think they voted for John Kerry? How about those rural voters south of Mobile, AL, who proudly fly Confederate flags outside their homes and businesses, not as a tribute to history (then the US flag would be properly displayed, as well) but as a message? As a young, multiracial man, I have been most unimpressed with the Republican Party's record on issues of race, which still, unfortunately, dominate our politics. I invite you to prove me wrong, but throwing out Condoleeza Rice and Colin Powell (who, by the way, is a moderate Republican and considers himself so mainly because of military issues..I've actually spoken to him personally about this) are no proof of enlightenment. Our politics are more than a little racially tinged, and your party's voters and policies have consistently been on the wrong side of history. Don't feign outrage when someone dares to point this out, or attempt to revise history. If you can explain why, in the 1960's, the south's voting pattern changed from Democratic to Republican, I welcome the explanation. I appreciate your response. You raise interesting questions. First, race is only one dimension of the political landscape.It should not be assumed that through the shifts of party allegiance, that no personal and ideological evolution occurred. Today, affirmative action and fair ways of extending help to the disadvantaged of any race are legitimate issues. Secondly,the question of whether King was a Republican is a cut and dried fact. You can argue about the evolution of that party designation means now and back then, but you should be precise about that. Thirdly, I believe that both parties have strived for extending America's opportunities to all ethnicities. There are major tactical and philosophical differences between the two parties that should be debated without acrimony. Your statement about the higher angels of nature is metaphysical. It does not belong in this discussion. I welcome the change of heart in the American people that made the election of an African American possible. I also welcome the freedom to judge him by his record, which I find sorely wanting. You can not deny or trivialise the advances of African Americans in Republican administrations. We have reached a point in the evolution of the American people where racism is truly disgraceful. I feel confident that the debates that have surrounded the tactics and philosophy in this evolution will shape interesting and promising developments in our future.